PennDOT (Pennsylvania Department of Transportation) and state police are urging drivers to obey recently updated Pennsylvania traffic laws. State law enforcement will use education, community outreach and social media to emphasize the importance of following traffic safety laws. Automated speed enforcement. This law was introduced to Pennsylvania drivers in 2018, and it is only enforced when a work zone is active. If drivers are going more than 11 miles per hour over the speed limit in a work zone, they are subject to a warning for their first offense, a $75 fine for their second offense, and a $150 fine for their third offense. “Steer Clear” law. This rule was originally created to help avoid serious injuries and to prevent collisions involving first responders. Drivers must move over or slow down when they see an emergency scene, traffic stop or disabled vehicle. This includes moving over or slowing down for all responders (police, fire and ambulance crews, as well as maintenance and tow trucks). In 2018, an addition to the law was made to include trash and recycling workers. Drivers must slow down and move away, if possible, from a stationary recycling or trash vehicle. DUI convictions. Pennsylvania improved penalties for drivers convicted of a DUI. If you receive a fourth DUI in 10 years, you can receive a felony. A third DUI offense can also be counted as a felony, depending on the blood alcohol content of the driver. Removing snow and ice. Snow and ice can still occur throughout Northeastern Pennsylvania in April and May. Now, if a driver fails to remove snow or ice from their vehicle, and that snow or ice strikes another vehicle or pedestrian causing serious injury or death, the driver will face a fine of up to $1,000. “Turn Around, Don’t Drown.” This is a reminder for drivers that they cannot pass around or through a traffic-control sign or device that is closing a road due to a hazard. This has now become a summary offense and could result in a fine of up to $250. 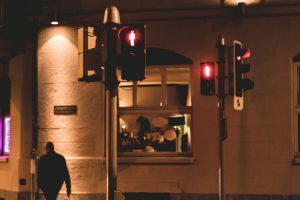 “Right-of-way for pedestrians in crosswalks.” This state law reminds drivers that they must yield the right-of-way to a pedestrian crossing a road with a marked or unmarked crosswalk (if a traffic-control device is not in operation). This is also now a summary offense with a fine of up to $50. Our Wilkes-Barre personal injury law firm wants to make sure Pennsylvania motorists are driving safely and avoiding any serious accidents on the road. However, if you have been in an accident that caused an injury, you should speak with an attorney who can help you recover compensation. Contact our office today for a free consultation.